GST-tagged Progesterone receptor ligand-binding domain (PR-LBD) consists of a 218 a.a. GST tag (Schistosoma japonicum Glutathione S-Transferase, Acc# 1M99_A), a 31 a.a. flexible linker and a 305 a.a. PR-LBD, Acc# NP_000917, amino acids 630-933 (details). It was produced in complex with human Hsp90 to facilitate native protein conformation and advanced performance in ligand binding and coactivator peptide recruitment assays (details). Progesterone receptor is retained in the cytoplasm in complex with Hsp90. Receptor-Hsp90 complexes rather than the receptors free of Hsp90 are natural ligand-binding entities. Upon hormone binding receptor dissociates from hsp90, is activated and is transported into the nucleus (Kakar et al., AAPS J., 8(4):E718-28, 2006). Progesterone receptor that is stripped of Hsp90 quickly looses hormone-binding activity at physiological temperatures (Smith DF, Mol. Endocrinol., 7(11):1418-29, 1993). A complex of human PR-LBD with human Hsp90 (PR-LBD/Hsp90) was produced in insect cells co-infected with two recombinant baculoviruses, i.e. BV-PR-LBD™ that encodes GST-tagged PR-LBD and FoldHelper™-905c which provides for expression of Hsp40, Hsc70, Hsp90, Hop and p23 human molecular chaperones. Cells were cultivated in the absence of exogeneous ligands to ensure availability of the ligand-binding site. PR-LBD/Hsp90 complex was purified from soluble cell fraction without the use of detergents, high-salt buffers or chaotropic agents and was formulated at about physiological conditions. 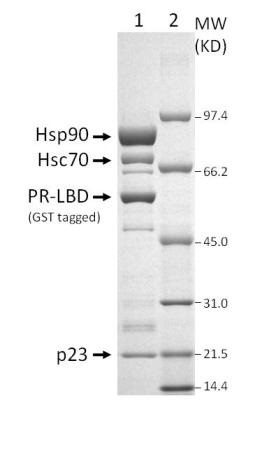 GST tagged PR-LBD and Hsp90 are the major components of the complex (Fig. 1). receptor LBD in complex with Hsp90. 2. Low range molecular weight marker (Bio-Rad).